If you want to visit Disney World on a budget, timing is the single most important factor to consider. The best time to visit Disney World is when crowds, prices, and temperatures are all bearable—or when there is an irresistibly great Disney vacation deal on the table. A foolproof strategy is to stay at one of Disney's value resorts during a time when prices are at their lowest. Figuring out when rates are lowest can be tricky, as prices are affected by a wide assortment of factors, including day of the week, special events (such as marathons or festivals), seasonal holidays and school breaks. Staying on-site at an official Disney World Resort hotel comes with value-added benefits that save you both time and money. For example, guests at Disney properties receive complimentary transportation to and from Orlando International Airport and their resort. Guests are able to take advantage of Extra Magic Hours and a 60-day advance reservation window for FastPass+, which are two benefits that save you a lot of time waiting in lines. The most important thing to know about pricing is that Disney uses a surge pricing model for its resort rates and single-day tickets at Disney World. This means that prices fluctuate with demand, with higher prices during peak periods and lower prices during slow seasons. What does this mean for your family vacation? It makes more sense than ever to visit when the parks are least crowded. If your family can be flexible and visit at less crowded times, your vacation will cost less. If you visit Disney World during school breaks, special events, and holidays, your vacation costs will be higher to reflect this peak timing. Visiting Disney World for more than one day? For multi-day tickets, the per-day cost remains substantially less than for single-day tickets. The more days you buy, the less you pay per day. 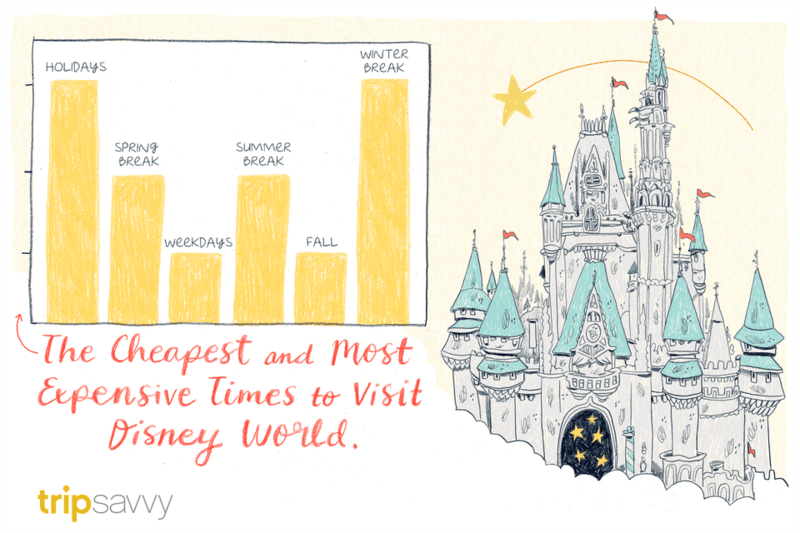 Holiday Periods: The most expensive time to visit Disney World is during the Christmas holiday and Easter break. The price of hotels (and hotel-plus-ticket Magic Your Way packages) can be twice as high as during the regular season. Holiday periods in 2018 are Easter (Mar 25-Apr 5, 2018) and Christmas (Dec 21-31, 2018). Peak Periods: After the holiday periods, the next most expensive times to visit are during peak periods, which generally coincide with other school vacations and special events. Peak periods in 2018 are: Presidents Day/Winter Break (Feb 16-24, 2018) and Memorial Day Weekend (May 25-27, 2018). Slightly less expensive times include Winter Break (Feb 19-24, 2018), Spring Break (Mar 9-24 and Apr 6-7, 2018), Summer Vacation (May 28-Aug 11, 2018) and the week prior to the Christmas peak season (Dec 14-20, 2018). Are your kids too young for kindergarten? Or do you homeschool your kids? The weeks immediately after New Year offer some of the very best rates of the year (Jan 2-Feb 10, 2018, with the exception of Martin Luther King weekend). School kids head back in class following the Christmas break, so the parks are less crowded then, too. Also less expensive than Disney World’s so-called “regular” season is the long fall season (Aug 26-Dec 8, 2018, excluding Columbus Day and Veterans Day weekends and Thanksgiving). While hotel prices rise slightly for holidays such as Halloween, they are still much less expensive than at holiday and peak times. Even Thanksgiving is less expensive than Easter and Christmas. Note that during the low-season periods—particularly January and the fall between September and mid-December—Disney often offers packages that include a free dining plan. This can be a super offer, so keep an eye on the page of Disney vacation deals leading up to those periods. Planning a multi-day vacation at Disney World on a budget? Consider a Sunday to Thursday stay. Midweek rates are almost always less expensive than weekend rates, so sliding your vacation window to hit only weekdays or mainly weekdays will not only save you money but you will also encounter fewer crowds. It should go without saying that you should always do the math to compare the true cost of different deals that may be offered at the same time. For example, a package with the free dining package may not be better than a special offer delivering a 30-percent savings on lodging.